Xiaomi has released its new tablet in the Mi Pad series, Mi Pad 4 in China as it had promised. The Mi Pad 4 launched in two variants according to connectivity- a Wi-FI only model and Wi-Fi + LTE model. The Mi Pad 4 comes with 8 inches display with 16:10 aspect ratio and can be used with a single hand. It also comes with AI Face Unlock feature and smart game acceleration feature. Xiaomi Mi Pad 4 price starts at CNY 1,099 (Rs. 11,500 approx.). Xiaomi Mi Pad 4 comes with an 8 inches FHD display with 16:10 aspect ratio and 283ppi pixel density. The tablet is powered by a Qualcomm Snapdragon 660 SoC which is clocked at a frequency rate of 2.2 GHz. The processor is paired with 3GB and 4GB of RAM. The tablet comes with a 13MP rear camera with f/2.0 aperture size and with HDR support. The front-facing camera is a 5MO camera with f/2.0 aperture size. 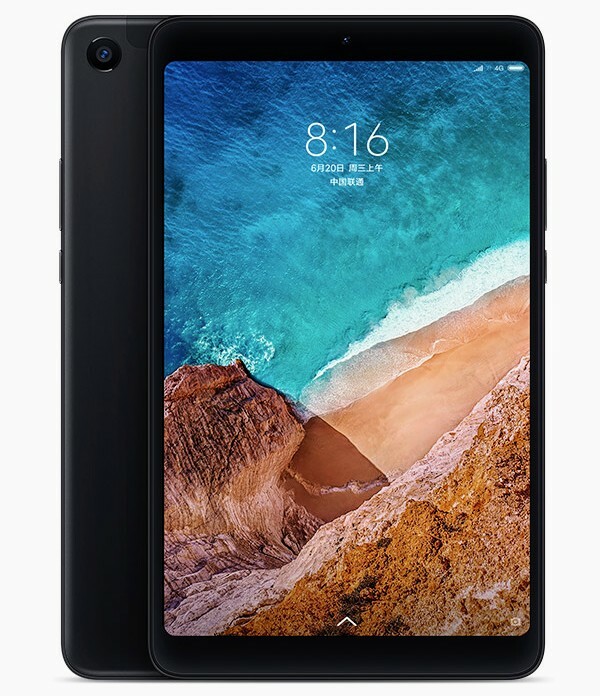 Xiaomi added an AI Face Unlock feature to the tablet with no fingerprint sensor. The tablet comes in 32GB and 64GB inbuilt storage capacity which is not expandable. The Mi Pad 4 comes with 4G LTE (selected variant), Wi-Fi, Bluetooth 5.0, 3.5 mm audio port and USB Type C. The GPS is only available in LTE variant of the tablet. The sensors include an accelerometer, ambient light sensor, and gyroscope. The LTE variant includes a digital compass too. The tablet is powered by a 6000 mAh battery. Dimension wise, it measures 200.2×120.3×7.9mm and it weighs only 342 grams. The Xiaomi Mi Pad 4 with 3GB RAM and 32GB ROM is priced at CNY 1,099 which is roughly Rs 11,500. The WiFi only version is priced at CNY 1,399 (approx. Rs 14,600) with 4GB RAM and 32GB storage. The Mi Pad 4 with Wi-Fi and LTE variant is priced at CNY 1,499 which is approx. Rs 15,600. The first sale of the Mi Pad 4 is on Friday, June 29, the registrations for the sale is now open in China.